Despite their high FIFA ranking and player ranks that boast the likes of Crisitano Ronaldo, Nani and Deco – Portugal had a diabolical run into the World Cup. Qualifying was hard-fought, sneaking by a single point into second place, putting them into a play-off with Bosnia-Herzegovina. Portugal won both legs of the play-off 1-0, earning their right to play in the 2010 World Cup. Captain Crisitano Ronaldo is a relative unknown on the World Stage, who is looking to make his big break at the Wor… Who are we kidding!? Most Expensive Player in the World (TM) Crisitano Ronaldo is one of the most complete players on the planet, and if he’s firing on all cylinders Portugal have the quality to beat anyone. Chelsea man Carvalho is known for his fearless nature, playing anywhere he’s needed across the back line. His versatility puts him in good stead with the manager Quieroz, and his experience makes him a valuable asset to have in the Portugal dressing room. Carlos Quieroz learned his trade at Old Trafford, as assistant manager to Sir Alex Ferguson. Since taking control of his home country’s national squad, Quieroz has guided them through a disastrous qualifying campaign and into the World Cup. 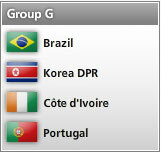 From here, Carlos will be looking to guide them out of the Tournament’s Group of Death.